I am a massive fan of subscription boxes! I love getting parcels in the post each month that have mystery items in them. It is like getting gifts every month, only they are from yourself! I have found some really interesting items in subscription boxes that I normally wouldn’t get. I mainly get beauty boxes but ‘My Purrfect Gift Box’ has to be one of the most interesting boxes I have come across! My Purrfect Gift Box is a box specifically for cat lovers! Whether you own cats or you love them without having any, then this box is for you! There are different options to what box you can subscribe to, if you have cats then you can get a box that includes treats for your fur baby or you can get a box that just contains cat-related items for yourself. As I have 3 fur babies the box I got contains items for my cats. There is so much in this box it really is unbelievable. Everything is so pretty! I usually find with subscription boxes not all the items are great, you usually get one really good product and a couple of ‘meh’ products… Well, not with this box! Everything is amazing and also useful! Inside a cardboard box was this gorgeous necklace! It has quite a long chain and is a brassy colour, so will be great to add that something special to any outfit. There are pretty dry flowers encased in glass as its body, so each one will be unique and slightly different. It is just so pretty and I know I will get a lot of use out of this necklace. People have already been asking where I got it from. You can purchase it from their online shop for £9.99 if you want one for yourself. Now how cute is this scarf! It is super soft and has metallic printed kitty cats on it! The scarf is a grey colour so you can match this with any outfit. It will literally go with anything. I love it when I get an accessory that is so versatile, it means I will actually use it rather than sticking it in my wardrobe where it will end up staying! 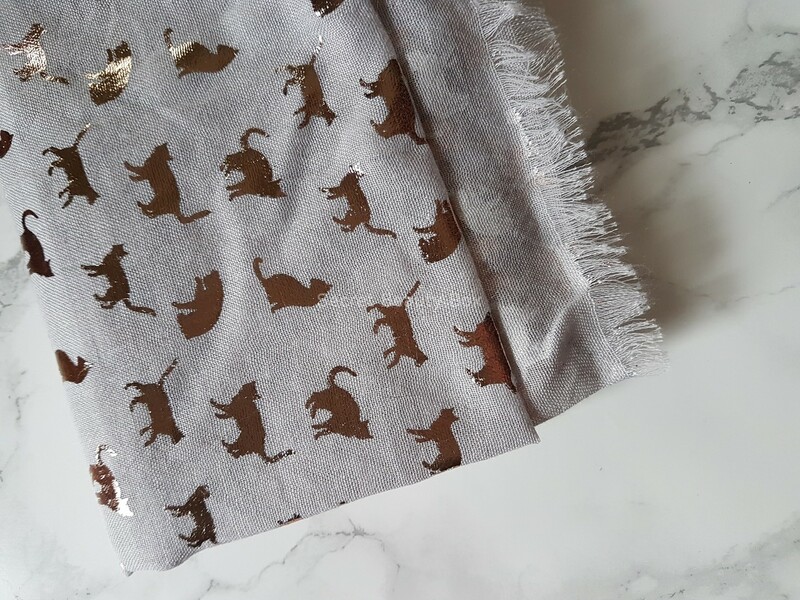 If you are a big cat fan then this is just so perfect, it’s such a nice way to subtly add your crazy cat lady-ness to your style! I think I got a little bit over excited when I saw this in the box, a little squeal may have even come out! This purse is HUGE and I absolutely love it. I have always had massive purses so this is right up my alley! 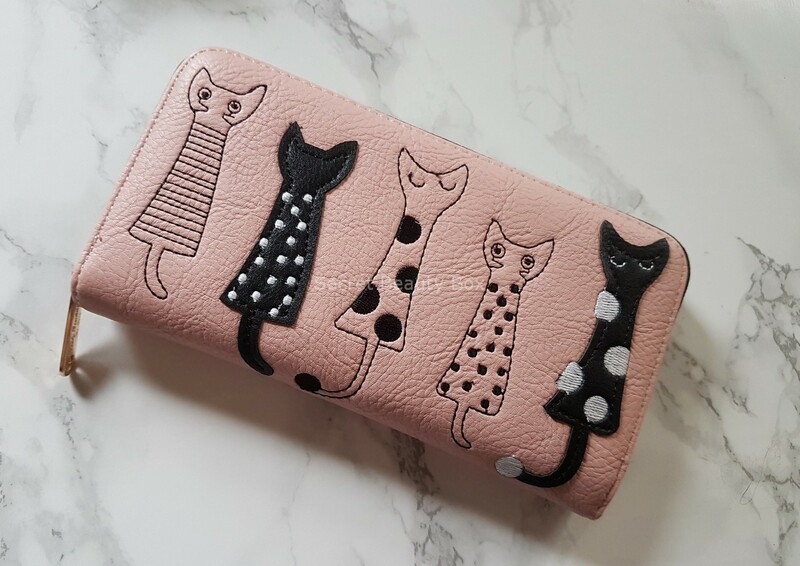 I really love how this purse looks, the cats are done in a cute abstract way, which make it a little bit more sophisticated while still letting your cat craziness out! This purse is such good quality, the cats are all stitched on so you know they won’t be going anywhere. It has several compartments and a zip section and some space for your cards, perfect! This will really catch people’s eyes when you pull this beauty out of your bag! 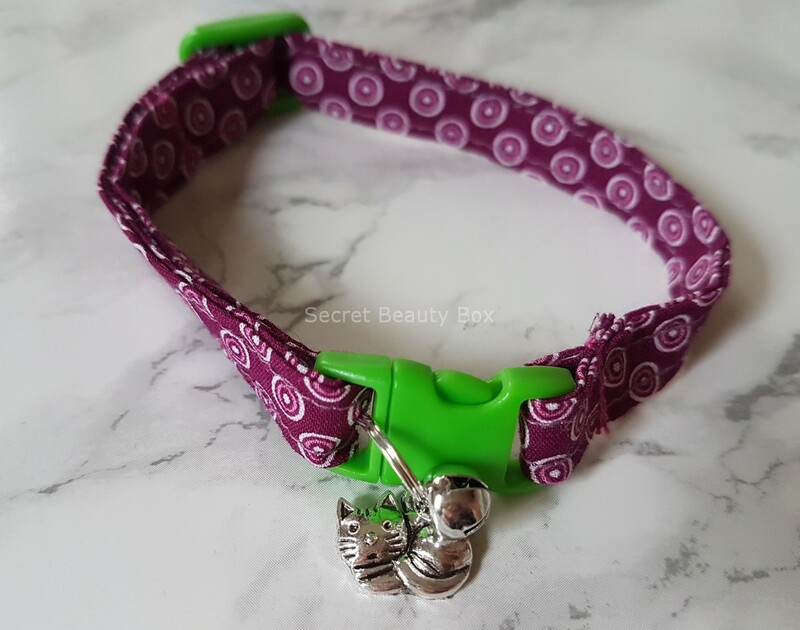 This handmade cat collar is adorable! 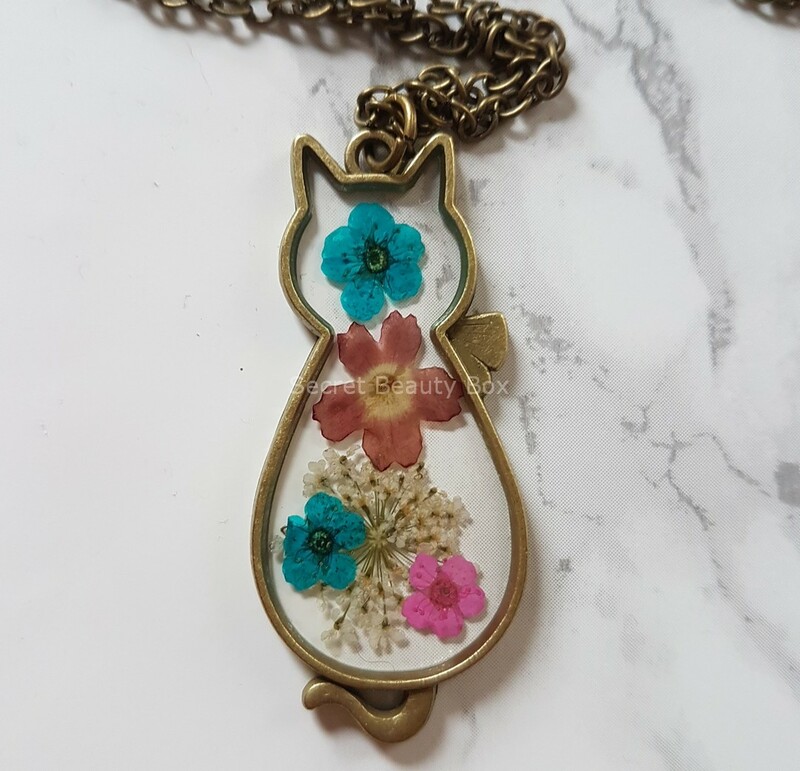 It has a cute little cat charm on it and a tiny bell. The bell isn’t substantial enough for any of my three though, so that would need to be changed. I really like the colour and this would suit a male of female puss. The collar is very well made, unfortunately though I don’t think the material would be tough enough for any of my rascals. They can get a bit boisterous! 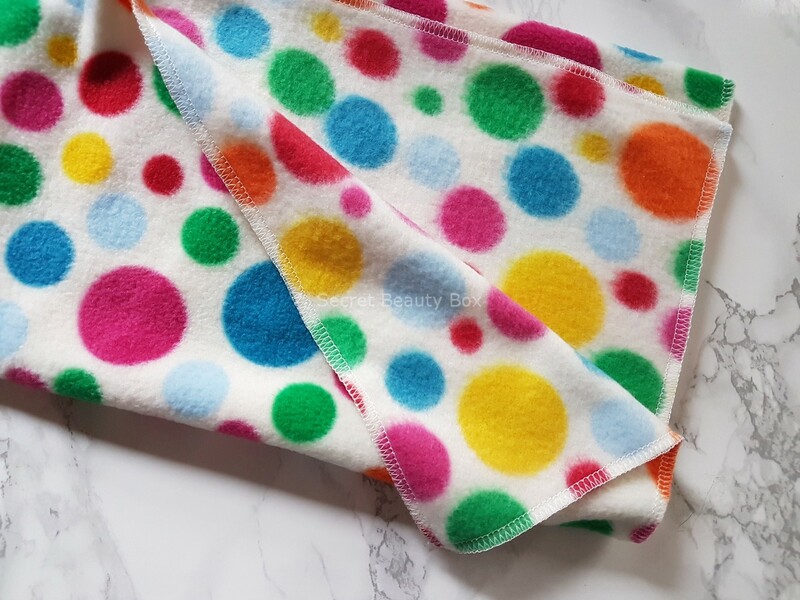 This would be ideal for a kitten though as it is soft and light. 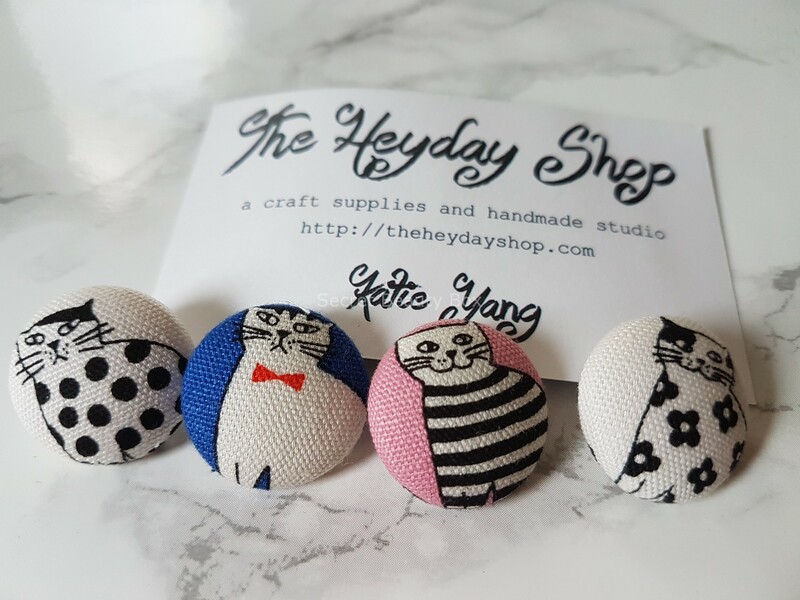 Just look at these handmade buttons! They are adorable! I’m not too sure what I will end up doing with them. They would probably look good on a really cute dress, but I don’t really have anything like that. If you have any suggestions on what I could do with them please let me know. Just thought, I could make a set of draws from old beauty subscription boxes that I have seen people make and use these buttons as the draw handles! I really don’t want these to go to waste, I do want to use them for something. Chocolate! Who doesn’t love chocolate! I’m amazed I managed to take photos of this before demolishing it. This is from ‘The Quirky Gift Library’ and is purrfect for this box. There are so many bars to choose from on their website. There is something for every occasion, you just need to have a look at their site to see how many are actually on offer. Such a great gift to give someone and it only cost £5.95. My middle cat Tilly is really happy with this wonderful handmade fleece. She has a slight obsession when it comes to fleeces, if I buy one that’s not intended for cats she will still claim it as hers! I’m loving the bright colours but the white will not stay white for long though as it will get covered in black cat fur! I had to be very quick when it came to taking this photo! These did not last long at all. As soon as I put them out the cats came and quickly scoffed them all up! So it is safe to say that they all enjoyed these treats a lot and went down very well. 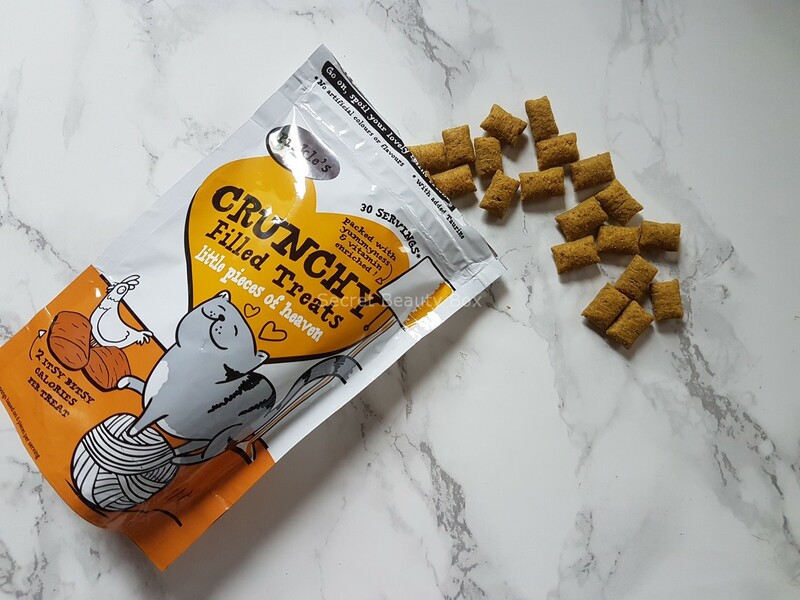 They are ‘Pickle’s Crunchy Filled Treats’ and I have seen them online at Pets at Home for 89p! I will definitely be buying my little rascals these again. I am completely in love with this box! 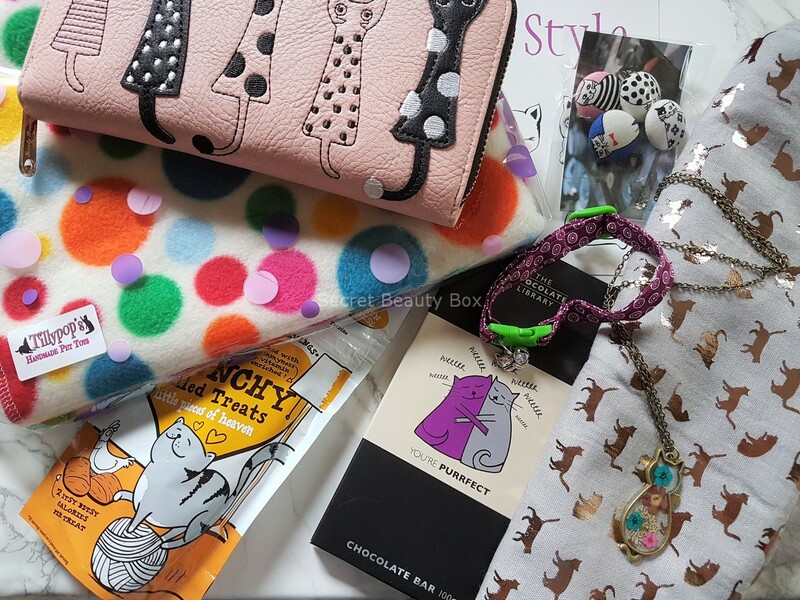 Who can resist cat themed products being sent to you each month?! With money going to cat charities you can buy knowing you are also helping other kitties out there, not that you need convincing to buy one of these beauties! 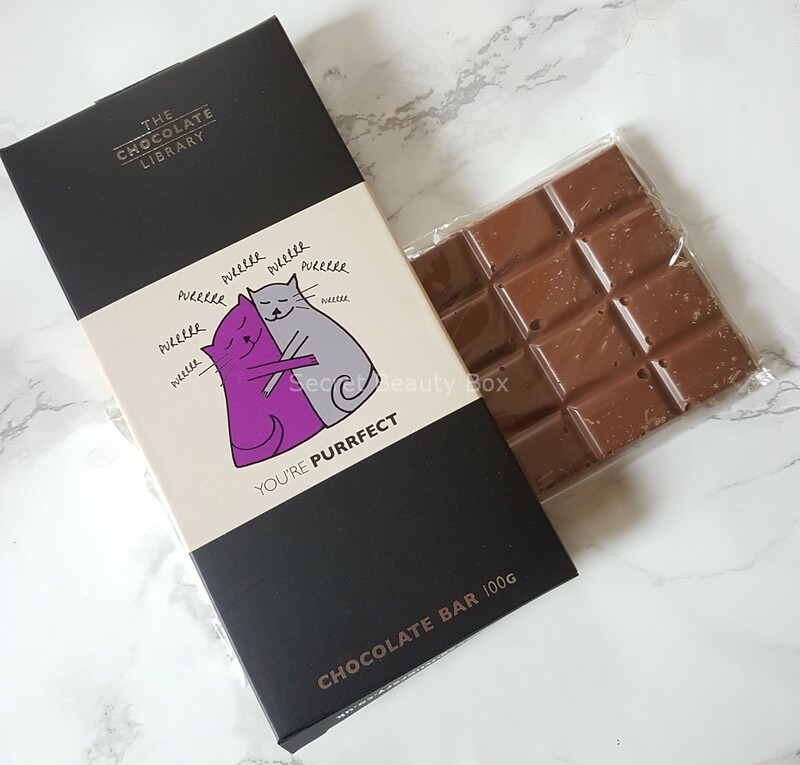 Have you tried ‘My Purrfect Gift Box’ or would you get one? Are you crazy about cats just like me?